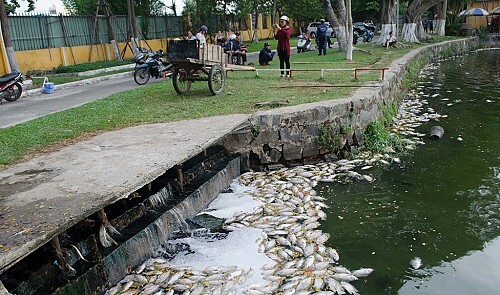 Tons of fish have been found dead in a pond at a park located in the central Vietnamese city of Da Nang. Fish from a lake in the 29/3 Park in the central hub were discovered having died en masse on Monday, releasing a foul smell upsetting many local visitors. Most of the dead fish were adult tilapias, some of which weighed up to two kilograms each. A smaller number of common carp and shrimp also suffered the same fate. The incident was noticed by hikers along the lake during the morning and quickly reported to managers of the venue. In an interview with Tuoi Tre (Youth) newspaper, Dang Duc Thu, director of the Da Nang Green Tree Park Company which manages the lake, confirmed that fish started dying early in the morning, adding that the phenomenon had worsened by the end of the day. The situation was later reported to the Da Nang Drainage and Wastewater Company, the firm in charge of supervising the quality of the pond, according to Thu. The total weight of the dead fish was expected to exceed two tons. A couple of months ago thousands of people protested in Ho Chi Minh City after hundreds of tons of fish were killed by industrial waste.